There are some movies that announce themselves as masterpieces. Others sneak up on us quietly. Inside Llewyn Davis sneaks up on us quietly. On a recent podcast, JB and I talked about who deserves the title of Greatest Living Director. The common wisdom is that it is Martin Scorsese. I won't argue that he's not deserving, and I haven't even seen The Wolf of Wall Street yet. But as soon as we finished recording that show, I immediately thought of the Coen Brothers. I should have mentioned the Coen Brothers. With two (maybe three) exceptions, they have built a career of brilliant, original films that are each like tightrope acts -- the smallest of missteps could cause every one of them to crumble. 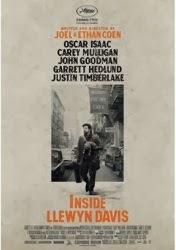 Their latest, Inside Llewyn Davis, is another such movie. So much of it should not work. All of it does. Oscar Isaac stars as Llewyn Davis, a folk singer living in 1961 Greenwich Village whose career has stood still since things ended with his partner Mike, with whom he released one moderately successful album. Davis is something of a disaster as a person; he's an artist with a ton of talent that's going to waste because he can't get a break or sabotages the breaks he does get. He sleeps on couches. 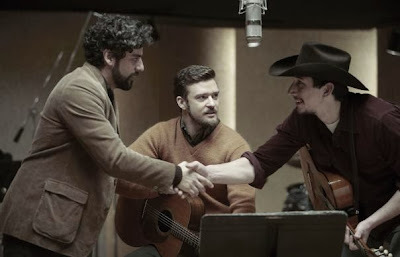 He depends on the kindness of friends and strangers, nearly all of whom wind up resenting him -- none more than Jean (Carey Mulligan), half of a folksinging duo called Jean & Jim (Justin Timberlake) who carries a lot of anger towards Llewyn. He keeps singing in the same club, making the same mistakes, practically reliving the same day over and over again. Something needs to change. The movie is being marketed as something of a comedy, but it isn't, really. It's funny in that often absurd, always deadpan way that the Coens are always funny, but it's not a comedy. It's actually achingly sad -- a movie on an endless loop of grief and pain and impossible obstacles, many of them of the main character's making. Inside Llewyn Davis is not a drag because it's filled with gorgeous music, wonderful performances and a lot of levity, but it is, at its heart, a tragedy of a potentially great artist's undoing. Funny that the Coens should make this movie as their follow-up to True Grit, their most commercial and successful movie to date (it grossed over $100 million). That movie, while still retaining enough eccentricity to feel like a Coen Brothers movie, was accessible for all audiences. This is not a traditionally commercial movie. It's much more akin to past Coen films like Barton Fink and A Serious Man -- sometimes puzzling, always brilliant character studies that understand how "compelling" does not have to mean "likable" and which reveal truths about the human condition by way of a single character in the process of coming apart. Llewyn Davis is not a bad guy. He's just selfish and stubborn and more than a bit of a fuckup. He's also sad and lonely and unable to process any of his feelings or his own responsibility in the rut in which he finds himself. A word about Oscar Isaac. Most viewers will probably recognize him as Carey Mulligan's doomed husband in Drive, but he was also one of the best things about Sucker Punch (in which he got to sing if you've seen the extended Director's Cut) and got to show off his troubadour talents in last year's little-seen 10 Years. He has quietly been building an impressive resume of smaller character parts, but this is the movie that's going to make him a star. 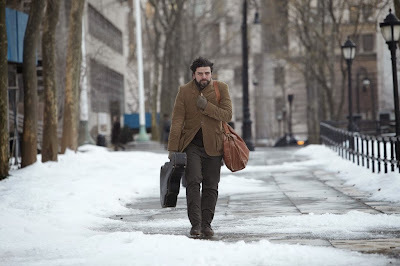 Isaac is terrific, internalizing all of the pain and integrity of Llewyn Davis and hinting at depths of humanity without ever making excuses for him or trying to make us "like" him. It is not a showy performance, but it is a brilliant one. Isaac also does all his own performing in the film's musical sequences, of which there are many. This is crucial, as having the actor switch to a prerecorded track would have yanked us out of the authenticity of the moment. It's unfair that Isaac be this good an actor PLUS be able to play guitar and sing so well. The movie is impossible to imagine without him at the center. It's as though Oscar Isaac was invented just so Inside Llewyn Davis could exist. Upon first viewing, Inside Llewyn Davis may seem like "minor" Coens, but that's too dismissive a label for a film this rich and haunting and lovely. At this point, watching a new Coen Brothers movie actively pisses me off because they never break a sweat; they make genius seem easy. Though it's a period piece, the film never loudly calls attention to itself as such. The filmmakers comment on the era (era) with small, subtle images, like one character being taken off in handcuffs or another collapsing on a bathroom floor after a drug overdose. Then there is the singer that takes the stage after Llewyn, barely glimpsed but unmistakably heard. The times, the Coens quietly tell us, are a-changin'. I could keep singing the movie's praises (See what I did? Singing? ), but it becomes unnecessary at a certain point. It's a great movie and one that deserves to be seen. It has gotten better every day since I saw it. Images stick with me. Moments that at first felt obtuse carry a weight seldom felt when we go to the movies. Besides, there is simply too much to unpack, too much to talk about here. Is this a film about how no man is an island? Is it a treatise on the difficulty of retaining one's artistic integrity in a world full of novelty songs like "Please Mr. Kennedy?" In of the movie's best scenes, Llewyn travels miles to meet with a record producer and performs for him a gorgeous rendition of "The Death of Queen Jane," only to be told simply "I don't see a lot of money here." One can imagine the Coens hearing that exact same response on any number of their films. 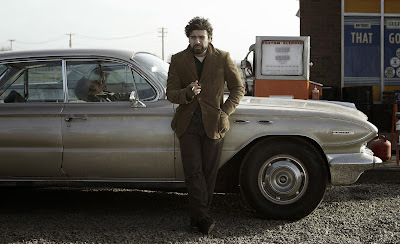 We must consider ourselves fortunate that, like Llewyn, they pushed on. Heartbreaking as it can be at times, Inside Llewyn Davis is not a movie devoid of hope. Yes, the cycles continue. Yes, we will make the same mistakes. But eventually, we'll keep the cat inside. Eventually, we can sing the harmony. Glad to see that the film delivered for you. The music that I've heard from this movie has me hooked, and the story seems right up my alley, not to mention the Coen Brothers are great and interesting film makers and artists, so I'm sure they know what they are doing. Man, with all these positive elements in place, combined with your positive review, I, like Tom above me, can't wait for this one. Making me cry at the movies is not an easy task. I can count the number of films that have done it on one hand. And the Coens got me as soon as Llewyn started chasing that cat through the subway. Though to be fair, I think the song had a lot to do with it, too.